Tuscany encompasses a large region of Italy and Florence is considered the regional capitol. Within Tuscany, there are several provinces. 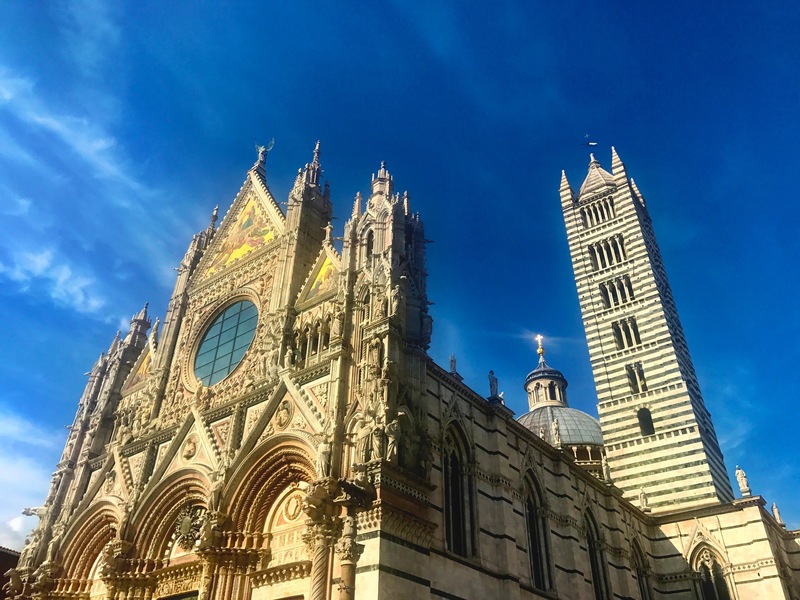 When you’re planning your itinerary within Tuscany, it is important to look at the geographical locations of the places you’re looking to visit. Since Tuscany is so large, it may not make sense to visit multiple places that are in different provinces. Some regions within Tuscany are hours apart. For example, Lucca is west of Florence. The hotel we chose was in Radda in Chianti which is south of Florence. We heard great things about Lucca and wanted to visit, but we also wanted to go to the Chianti region and a few surrounding areas that were all south of Florence, so we realized that staying in Chianti and cutting Lucca out made the most sense. Do not expect to go to Tuscany and see multiple provinces in one trip. That’s why we collect miles right? So we can come back! We ultimately decided to stay one night Florence and 2 nights in Chianti. While in Chianti, we also visited Montalcino and Siena. Here are photos and some things we did during our time in Tuscany. We arrived in Florence around lunch time so we used our wifi hotspot to look up lunch recommendations. We found this little spot called Alimentari Uffizi. They had a great selection of meats and cheeses and they had their own house wine. This place was so good! It’s #15 out of over 2,000 restaurants in Florence on TripAdvisor for a reason. We highly recommend Alimentari Uffizi for lunch! We only had one day in Florence but we were able to see a few things Florence is known for such as the Florence Cathedral (Il Duomo di Firenze), Ponte Vecchio, and a sunset. After walking around for a while, we found the cutest place. I say place because I don’t even know what to call it. It was a restaurant, bar, florist, gallery, and shop all in one place. It’s called La Menagere. They had the best and prettiest Aperol spritz of the whole trip. We highly recommend an Aperol spritz from La Menagere! We watched the sunset over Florence at our hotel because they had a rooftop patio with amazing views. They had a bartender to serve drinks and snacks. Looking for a place to stay in Florence? I talk a little bit more about our hotel in Florence and about other hotels in Florence in this post. We went to dinner at a restaurant close by for an obligatory Florentine steak. The steak was okay but the truffle pasta was amazing! After dinner we returned to our hotel to drink some wine and enjoy the night time views of Florence from the rooftop patio. We drove from Florence to our hotel and it was about a 90 minute drive south of Florence. It was a nice drive and once we were close to the hotel we decided to stop at a random winery. The owner of Casaloste greeted us and brought us to the wine tasting room. This was a great experience because we were the only people there at the time. So we got a private tasting and the server was great! She was extremely knowledgeable and explained how wines get certified as Chianti Classico. It was a nice introduction! I found one wine that I really liked for a very reasonable price. Now I need to figure out where to buy it in the states! They also had a really neat story about one of their wines that we could appreciate due to our medical backgrounds. IGT (Indicazione Geografica Tipica) wines are also known as “Super Tuscan” wines in the US. Super Tuscan is a term for wines made with non-indigenous grapes to the Tuscan region such as Merlot and Cabernet Sauvignon. According to my father-in-law who has spent the past few years studying wine, Super Tuscans were born when the Italians decided they needed to add something to their wines to compete with France’s famous wines. Basically, the Italians decided that in order to compete with France’s Bordeaux wines, they needed to import different types of grapes to blend with the traditional Sangiovese grapes in Tuscany. Casaloste’s IGT is called “Inversus”. This wine’s name was inspired by a rare congenital condition “Situs Inversus ” in which the major visceral organs are reversed or mirrored. The owners of Casaloste (Emilia and Giovanni d’Orsi) have a son who was born with this condition. They dedicated this wine to their son and the fingerprint on the label is his. The name Inversus also came about because they essentially reversed the recipe for their Chianti Classico. I love stories like this! If that doesn’t make you want to be a winemaker I don’t know what will. Tip: If you don’t want to pay to have wine shipped from the US to Europe, consider bringing some re-usable Wineskins to get your wine home safely in your suitcase! After Casaloste, we drove to our hotel. Each province within Tuscany is further divided into small towns/villages. We stayed in Radda in Chianti. It was a small town, but there were plenty of restaurants and shops. Our hotel, Relais Vignale, is situated close to everything in town. It also overlooked all of the beautiful vineyards in the vicinity. We loved this hotel and the location. It was charming, the rooms were nice, the staff was great, and there was a really nice terrace restaurant overlooking the vineyards where we had lunch. We highly recommend the Relais Vignale hotel and its restaurant. There was small vineyard within walking distance of the hotel that we were able to walk to and taste wine. Again, great views. For dinner the bartender at our hotel recommended a local restaurant and it was okay, but we had kind of wished we just ate at the restaurant at our hotel. We did find a really good place for gelato after dinner, though. Ryan and Allen decided that Grappa after dinner every night is a must (insert eye roll). As it’s name suggests, Grappa is a liquor made from grapes. It’s apparently popular for an after-dinner drink in Italy, but I thought it was disgusting! The next day, we hired a driver to take us to a few places in the region. We booked the driver through our hotel. It was 300 Euros for 8 hours for the 4 of us. The concierge also made us an itinerary. We did not have to organize anything, but if we had certain places we wanted to go they would have arranged that. Again, this hotel’s staff is great. Note that I emailed the concierge before our arrival. Hotels will do their best to help you book things once you arrive but there are some things that you will want to book prior to arrival and a driver is one of them. First we visited a winery for a private tour and tasting. 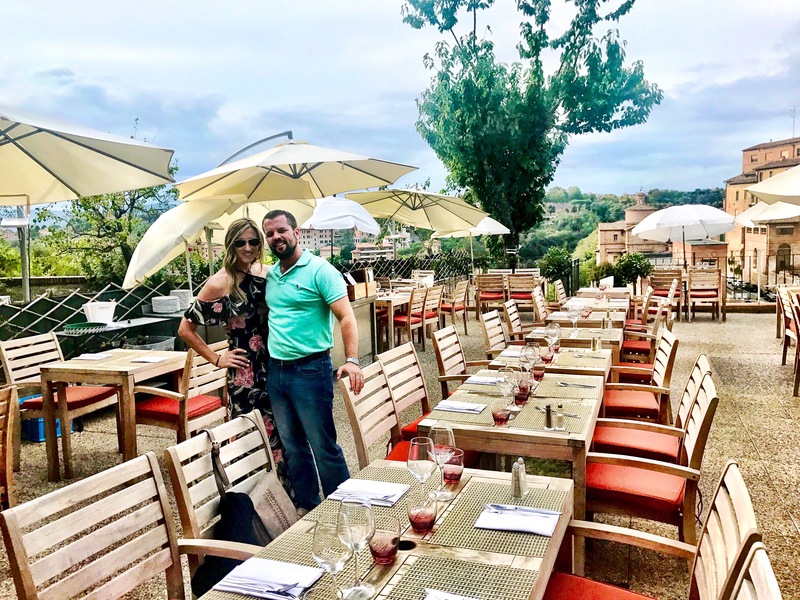 Altesino is in the Montalcino area and we learned how Brunello wine is made and what the requirements are for a wine to be labelled as a Brunello. It was impressive! Huge wine barrels. What could be better? After Altesino, we went to lunch at Enoteca la Fortezza di Montalcino which is a wine shop and restaurant in the fort. They also offer wine tastings. After lunch and some wine, we went to the top to enjoy the views! After lunch in Montalcino, our driver brought us to Siena. The Cathedral in Siena was beautiful inside and out! We walked around Siena for a while and then found this rooftop patio for happy hour! After happy hour in Siena, we returned to our hotel just in time for sunset and then we walked to dinner at a local pizza restaurant. Relais Vignale at sunset. Seriously, if you’re looking for a nice hotel in Chianti, check this out. Our time in Florence and Tuscany went by way too fast! I really have no complaints. My only suggestion is don’t try to fit in too much. Spend your money on wine tours, not plane tickets and hotels! Pingback: How we flew to Italy for (almost) free... and you can too! Pingback: Affordable unlimited data while abroad: get a mobile hotspot! Pingback: 10 days of 4-star hotels in Italy for free! Pingback: Spend more time enjoying Italy and less time in transit!